in the master bedroom today. with a pop of aqua. 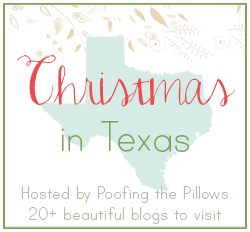 in The Christmas in Texas Blog Hop Home Tour. for all the tours this week in Texas. Good Morning! Your bedroom is gorgeous. I love the touches of aqua. The Santas are the perfect compliment to your color scheme. Your bedroom is so very pretty with just the right touch of Christmas! Enjoy this most wonderful time of the year! I love your pretty bedroom...looks so festive and I love your Santas...great job on a lovely post. Oh how lovely to meet you....I follow back! I fell in love as soon as I visited....just the prettiest bedroom ever! Wishin you a very Merry Christmas season! Celeste, this is all so elegant and pretty. Your sweet nature definitely shines through in the decor of your home. Your bedroom is beautiful. Love your Christmas decorations! Hi Celeste! Your bedroom looks beautiful! Love all of your touches and the bowl with all of the Christmas balls is so pretty. Hope you're having a good week. The pillow is so pretty and I love your other christmas decorating. I use to do that to all the rooms, but now only the living room and dining room. So pretty! I never decorate my bedroom and now I don't know why! ... with visions of sugarplums!!!!!!!!!!! Your bedroom touches make your room so inviting and cozy. You have a way with neutrals, Celeste. My favorite thing are the stockings hanging. I love your bedroom and can't wait to see more of your house. So pretty, with the Pop of Aqua!! I adore all of your pretty, whimsical Christmas decorations! You're quilt on the bed is just lovely, and the pillows grace it perfectly. Celestina Marie, Incredible bedroom design. Nice and comfy! Love the neutral colors on the bedding pillows. The carved (santa) man with the heart is cute. Neat idea to hang the stockings. Your bedding is just beautiful! See you at your tour, I will be the one drolling. The aqua is such a nice contrast with the beautiful neutrals! I have nothing but neutrals and white, with a bit of silver. LOVE IT! Beautiful! Love the pillow on your bed and the sweet vignettes! p.s. I had read Stacy's comment on your post yesterday, that she had tried to contact me. However, I never received her email. She has since opened a gmail account and we connected yesterday. I told her that I'd love to be included next year in the Texas blog tour, and thanked her for thinking of me. Oh so special for the season! All those lovely ornaments & decorations are so pretty in your bedroom! I love how you even decorate your bedroom! I might need to try this! Adore that little mouse in stocking pillow! Your house looks beautiful for the holidays! Very pretty! Decorating simply seems to be the way to go this year and you have done it perfectly. Such pretty accents. Love the pop of aqua! How pretty, Celeste! I was actually going to skip our master this year but you've inspired me! The old world touches you have, like the Santa's, make me smile. Your bed looks so festive and warm. Great job...looking forward to seeing more of your lovely home dressed up for the holidays! Very pretty and peaceful.....Wonderful as always. So a wonderful room - a dream - very Christmassy! Celestina Marie, Outstanding walk thru of your lovely home! Great presentation of your beautiful work and creative decorating for Christmas! Your bedroom looks beautiful!! Love your Christmas pillows.